Home > Afilias AU > What is Drop Catching? In today’s blog we’re going to talk about what happens to domains when they expire and in particular drop catching. We’re going to explain what drop catching is, and how it can be used to secure that premium domain name you have always wanted for your business, or to recover a domain name you have let expire. To understand drop catching you first need to understand the .au domain name lifecycle. In short, though, if a domain isn’t renewed it will eventually ‘drop’ from the registry and will be available for anybody to register. Twenty-four hours before dropping a list of expired domain names are published on this website for the public to see. If there’s a domain name on the list that interests you, you can try and register it through a conventional registrar once it drops. 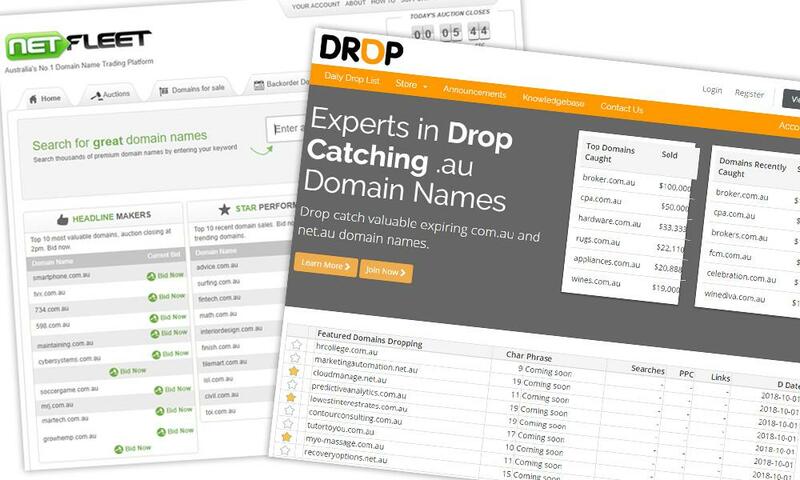 Alternatively, you can access the services of a ‘drop catcher’ (as the name suggests, they catch domains that drop from the registry) like Netfleet or Drop.com.au, who use special technology to quickly catch and secure domain names as they drop. Domains deleted for various reasons also find their way onto the drop. How Can a Drop Catcher Help Me? Because drop catchers have a higher chance of catching the dropped domain names, the service is especially valuable for premium domains that may be in high demand or for registrants who have inadvertently let their domain expire and want to get it back. The drop services allow you to bid on the domain names you want and if you’re the highest bidder you will be able to register the name if it is caught. To increase your chances of securing that important domain you can engage the services of both .au drop catching service providers. Generally, Drop.com.au and Netfleet share their wins on their websites. Just last week, surfing.com.au and surfing.net.au dropped from the registry. Netfleet successfully caught surfing.com.au for $10,678 and Drop.com.au managed to catch surfing.net.au for $1,000. It’s not often such valuable and useful domain names drop from the registry. Usually, they are closely guarded and protected by their registrants as they are critical brand assets. But, sometimes, the drop yields some real golden nuggets. A few months ago cpa.com.au was successfully caught by Drop.com.au and is now registered to CPA Australia. Their main domain name is cpaaustralia.com.au which is long and unruly. To secure cpa.com.au, which is short, memorable and consistent with their branding, is a huge win for the business. Let’s talk about Lucy, the fictional Gold Coast-based homeware shop owner, again. Let’s imagine when she started her business some years ago that she opted for lucyshomewaresgc.com.au as homewares.com.au wasn’t available. The domain has served her well but is a bit long and clunky and customers often type it incorrectly and get taken to a blank page. Lucy realises that her preferred domain is about to drop. She engages both Drop.com.au and Netfleet to try and secure the domain for her, as she would much prefer to have the shorter domain. The domain drops and one of the catchers secures it for her. She is the highest bidder with a $1,200 bid and is over the moon with the investment as the new domain name is much better for her customers. She registers it for 5 years for peace of mind.